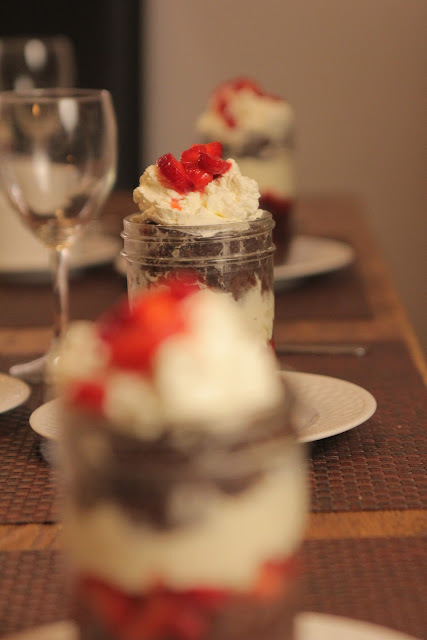 The Colors Of Indian Cooking: Cake In A Jar...And Don't Just Leave It At That! You know how sometimes you'll hear or see something and you can't get it out of your head? No matter what you do or how you spend your day it's always lurking back there in the shadows, talking to you... calling your name? You don't? Maybe it's just me, but from the moment I heard about Cake in a Jar, I knew I was going to have to get into this big time. Now I know there's been a lot of stuff baked in jars and mini-baked, and mainly it's cupcakes, and sometimes it's pie, and it can get sort of twee after a while, and people complain, and some of the cupcake flame-wars I've seen are downright scary. I mean jeeze, they're just cupcakes, nobody's killing a small animal here. Stop all the hating. I have to admit it's kept me from posting stuff like this. That and I've had a natural aversion to "cutesie" desserts ever since I was a child and my mom had a few unfortunate "experiments." 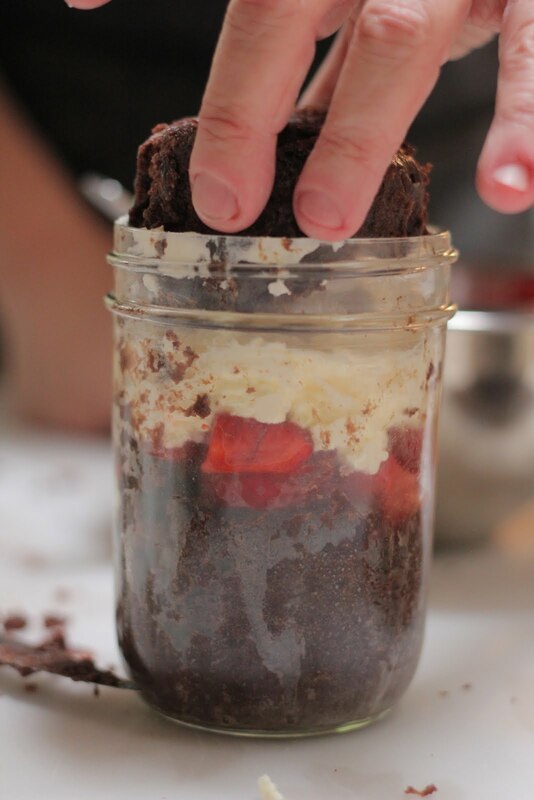 But this Cake in a Jar thing....damn! I just had to do it. 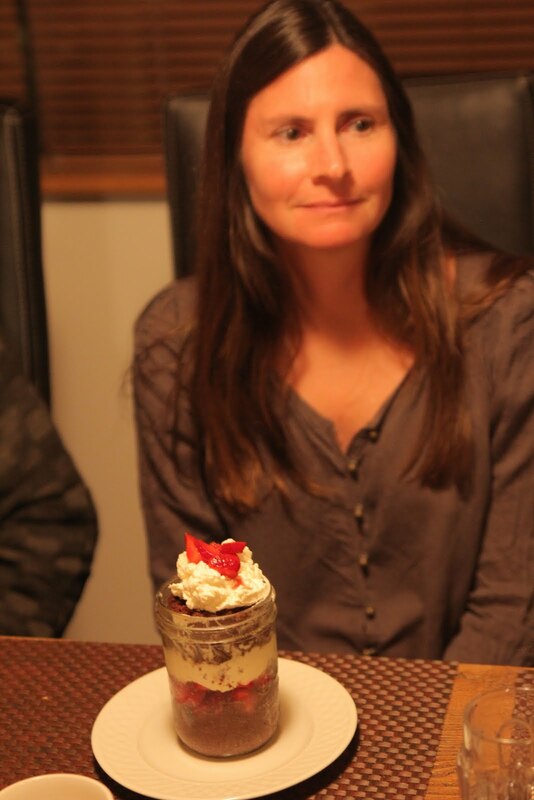 Once deciding that there was going to be cake and it was going to be served and cooked in jars, then came the next question...with Indian food?????? Hardly. I know I'll figure out a way to do that eventually, but I thought if I were going to make Cake in a Jar it had better be the culmination of a rather fresh and light and local Springtime feast. My annual Spring Fling Dinner. God, that sounds so Barbie. Okay, here's what really went down. Alan suggested we invite some friends to dinner Saturday night, and since there was all this amazing produce at the Farmers market, and I was feeling daring what with the Cake in a Jar thing and all, I said how about a real Americana feast? Oven fried Catfish with grilled green onions, Buttermilk biscuits, local blackberry honey, coleslaw, black bean, white corn and pepper salad, cold spring pea and mint soup as a starter, and of course that Thing for dessert. So we called a few friends made a date and I got researching on my Cake in a Jar. Turns out there are as many theories about Cake in a Jar as about Big Foot. Some bake them dry on a cookie sheet, some in a bain marie, some unmold and some don't, some use boxed cake mix while others go from scratch. Some claim it's dangerous, other say not. After sifting (baking joke there) through all the different options, I decided on Mr. Mustard in the Library with a Candlestick... in other words safe, in a bain marie and from scratch. The cake recipe is one I've been making for over 20 years. It originated at the famous Cafe Beaujolais just North of us in Mendocino. Originally developed by former chef-owner Margaret Fox, it's easy (even though there are a few steps) delicious and wait for it... vegan! Mix the liquid ingredients into the dry and whisk them well. Pour the cake batter through a strainer to get out any lumps. Mix it again, until the batter is smooth and free of air bubbles. Note:This is usually where I slip it into a greased and floured bundt pan, or cupcake pan, or layer pans or whatever I want. This time I was prepping my jars. Use 1 pint wide-mouthed canning jars. They're easier to work with and to fill. Run them through the dishwasher set on "sanitize" to sterilize them. Prep the seals and lids for canning. In short, make sure they are clean and sterile. Spray the inside of the jars with non-stick spray and flour them lightly. Pour the batter into the jars a bit below the halfway point keeping the sides clean. Place the filled jars in a deep-sided roasting pan (I used my turkey roaster) filled with hot water. Place the pan into the oven for about 30 minutes. Okay, here's where it gets interesting. It didn't work. I checked the oven after 30 minutes and instead of nice puffy cakes in jars I still had batter. I knew I didn't want to try the dry cookie sheet method as I am afraid of things that go bang in my oven, but there was one other strategy that I'd buried in the back of my mind, swearing as Meatloaf would say back in the 80's,"I would do anything for love chocolate cake, but I won't do that!" I'm talking about (shhhhhh) microwaving, yes I said microwaving cake, something I thought I'd never do. Of course in doing research on this recipe, many people talked about how easy it was to pop those little jars in the magic box and nuke 'em to tender deliciousness. Of course I thought that would never apply to me, but I was desperate. I had seven people coming for dinner the next night and seven little jars of my favorite cake batter. Was I just going to throw it all away on a matter of pride? Hell no! I put the first jar in the microwave and set it for 30 seconds. I stepped outside of the kitchen and around the corner. I warned Alan there might be an explosion. The beeper went off. I checked the cake. It had started to bloom in the jar. I tapped the buttons for an additional 10 seconds. It rose further. I tried 10 seconds more. Bingo! I had cake! I popped the seals and lids on the top and heard the pop pop pop of the little cakes in the jars as the vacuum took effect. I set the jars aside until the next evenings' festivities. Purchase an envelope of whipped cream stabilizer at any cake or pastry shop or market. A single packet of it blended into a cup of whipping cream allows the cream to stay stiff and keep it's shape for several hours. Add two packets of whipped cream stabilizer to 1 pint of whipping cream. Pop off the lids on the cake jars. Run a knife around the inside of the jar to loosen the cake. Remove the top half of the cake. It should break off fairly evenly but even if it doesn't it's not important as it will be stuffed back into the jar and covered before serving. 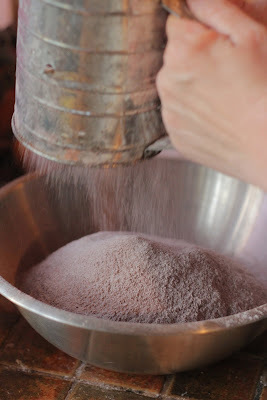 Set the cake top aside and wipe down the inside of the jar, cleaning off the flour that may still remain. Slice and mix fresh strawberries with 1 Tbs of sugar, if the strawberries are sweet enough no sugar is necessary. Spoon strawberries onto the top of the cake that remians in the jar. Press the top layer of the cake back into the jar. Place the jars in the fridge until serving time. 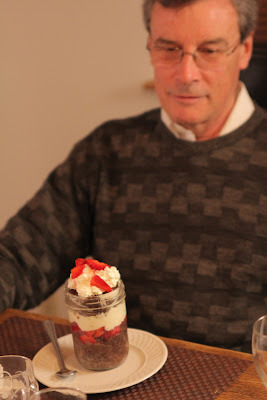 Just before serving, remove the tops of the jars and add more whipped cream and strawberries. Serve. Oh their faces when they saw Alan come out of the kitchen with these babies. We put them on the table and stood back. Happy diners was an understatement. This was party food... you're turning 8 years old party food. So, will I do this again? You bet. I could have made a vegan frosting to go with the vegan cake and next time I will. For those of you out there who are vegan, this should be pretty easy. I'm also curious as to how this will work with a gluten-free cake recipe. As to baking, from now on I'll skip the bain marie and go straight to the microwave. Who's going to stand on ceremony when it comes to this. Wow! totally brilliant!! love the concept...will give it a shot soon...love the pictures too. You are so funny. =) You always make me chuckle - I wish I was one of those happy diners. This looks amazing both presentation and flavor combination! This is definitely a crowd pleaser hopefully when i host more dinners in the future I can use this as inspiration! THX! These are so fun!! I bet the were a huge hit! What a fabulous party dessert! Love how you tweaked it till it worked...brava, Kathy! I love this! Single serve desserts are great for a dinner party or for when I want to control my cake eating :) Great post! This is wonderful! I love how you were able to take out layers, add layers and make it look even better. Oh, how cool.... you bake the cake in the jar! 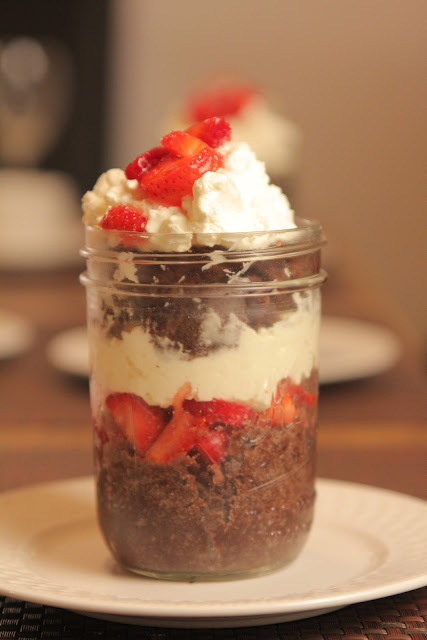 I've never had cake in a jar, but it looks awesome and I bet tastes even better! Love it. love your writing and love you (ok so we haven't met yet). thanks,Alan suggested something on our dog walk this morning that might make it even better! yep, single servings are a natural brake on pigginess for me. Great take on cake. I am craving cake now! I am always craving cake! This looks divine. I am such a fan of both mason jars and cake that I can only imagine how much this dessert (or meal?) would please me. These look delicious! Never heard of this concept before, but it looks so fun and yummy! Thanks! Oh..you are so innovative, Kathy! Love those cakes in the cups and strawberry over that. Lovely. I've never made anything in a jar before though my brother-in-law gave me recipe book once for these types of treats. I'd need to get jars and where would I store them? I keep mine in the garage, but then my garage looks like the storeroom from Raiders of the Lost Ark!